This is my card (Click photo for enlarged view) for Clear Dollar Stamps Weekend Color Challenge #38. This weekend's hostess is Cassie. I had this idea in my mind to make a snow card using the Cool Ride sentiment as a play on words. Wonder if anyone, besides myself will get it. Hee. WHAT I DID: I used the stair step fold technique. My card base is Close To Cocoa. I cut out white panels and punched the Martha Stewart Around the Page Snowflake border punch than cut it to size for all three panels. I then placed micro brads on some of the snowflakes. I stamped the new release FORD COUPE 1939 from CLEAR DOLLAR STAMPS on watercolor paper and using the ink pads of the chosen colors and an aqua pen I watercolored and cut out and popped up the image with dimensionals. My sentiments are a new release COOL RIDE also from CDS. I stamped the Cool Ride on the front and embossed it then punched out two 3/16" holes and threaded the ribbon through and knotted it. The back sentiments I stamped the rust one first and then the others (not embossed). I had trouble with this turning out and you can see my stamp mess ups on the senitiments, but I was not about to scrap this one. It is for my Step-father for his birthday that is in December. I think it will work. This turned out great Lisa. I love the stair steps. I have only tried this once. Great image for this car. Super job. Lisa, you are so clever! Cool ride, indeed, in December in that car! LOL! I'm impressed that you made a card now for December. It's so cute! How are you feeling dear? Too fun, Great stair step card. I have never made one of these, looks great! Clever girl! Wow, never would have thought those colors could be for winter! so awesome! 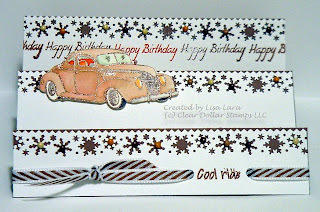 Yo did a beautiful job on this, Lisa...I love how you embossed the car and your coloring is gorgeous!!!! !